22a proudly present’s the 4th studio album from the Tenderlonious led jazz quartet – Ruby Rushton. 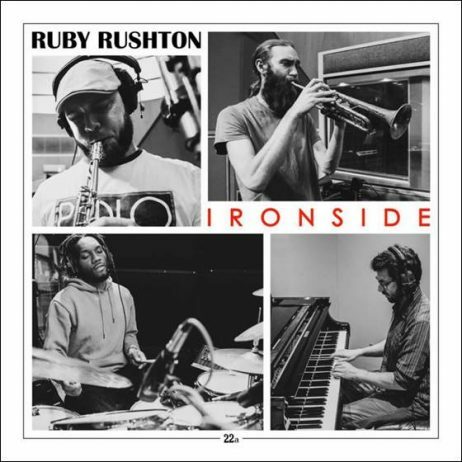 ‘Ironside’ is Ruby Rushton’s most complete work to date and was recorded over a 2 day session at the legendary Abbey Road Studios. ”Ironside” – meaning someone who is “courageous and possessing great physical and mental strength” sums up the Ruby Ruston journey so far. A personal, against the odds journey, that required Tenderlonious starting a label, 22a, back in 2013. Nobody much cared about jazz back in 2011 when the first Ruby Ruston album (‘Two For Joy’) was recorded, so the 22a platform was built, a home for friends and members of the family to release music from. Fast forward to 2019 and the jazz landscape is looking a whole lot healthier. The solemn beauty of “Prayer for Greenfell” is a respectful and dignified memorial, befitting of the magnitude of many lives stolen and “Pingwin VI” is dedicated to another hero of Tenderlonious – the Polish jazz legend Kristof Komeda.